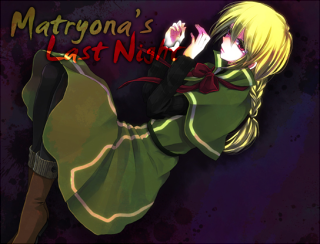 Matryona's Last Night is a 'dark adventure' game on the label. 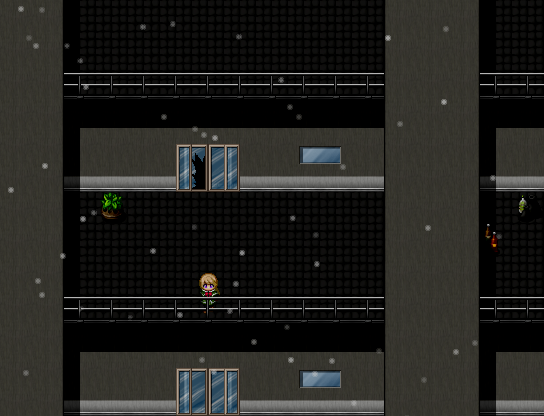 Basically, it's a short story in game format -- wander around the world, interact with items, view some dialog, advance. It has some horror elements but isn't particularly extreme. 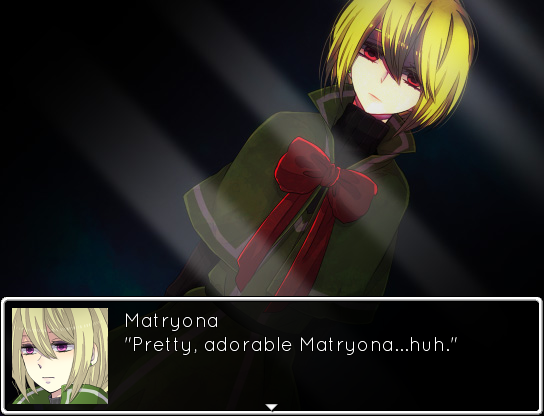 Your job as the player is to guide Matryona through the house, search the right items, and learn the truth about "pretty, adorable Matryona." There are two endings, although searching out the "true" ending probably isn't required to get the gist of the game. Notably, the game is about half an hour, which in my opinion anyway, is a good excuse to play it. However, that also means it's hard to talk about Matryona's Last Night without invoking spoilers because, well, they happen like five minutes in. The second half of this review about the story will be spoiler-y so if in doubt, take the 20-30 minutes and play before reading. The review is short for the same reason. The game takes place entirely within Matryona's house, about six maps. There's minimal sound and for the majority of the game no music (a choice I agree with) so the game can at times feel a little bare. Luckily there's some nice insert art to break up the RMVX-style chibi, and it's a nice touch of personality. When I mentioned Matryona's Last Night to essentially be a short story, I think that holds in its mapping style as well. Mostly everything searchable, and you'll end up searching mostly everything, but it's just a vehicle to move the story. The maps aren't much to look at and don't have much of a distinctive style. 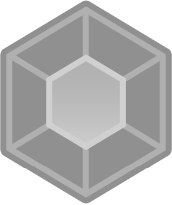 It's nothing offensive, and mapping isn't exactly the focus of the game, but because the player will be spending a lot of time just searching stuff, the focus falls there. SPOILERS remember. Basically, it's a time loop. When thinking about the narrative of this game, I think it can be separated into two parts: the story itself and the vehicle to deliver it. The story is about Matryona's upbringing as a girl and the murder of Matryona's family by his own hand, and the story structure is a time loop starting with the future first, and gradually looping back to the events of the titular last night. I'm a sucker for time shenanigans, maybe, but I like the way Matryona's Last Night is told. By working through the story non-linearly, there's room for the player to piece together what happened (I guessed pretty much everything ten minutes in) and even once you realize what's going, there's still at least some tension -- Matryona is doomed to commit murder, whether you as the player know it's coming or not, and that loss-of-control inevitability can be compelling. Execution-wise, it felt drawn out (even when it's obvious what's going on, Matryona has a few monologues to dead people that don't do much). Still, it's an engaging way to tell the story and I think it's effective, even if the actual story content is predictable and causes the format to lose a bit of its power. Yeah, I know. That's the problem. As for the story itself... It's a gender issue, which I'm mostly unqualified to respond to critically but will try anyway. Matryona is male, identifies as male, but his mother forces him to identify as female, running the gamut from dresses to makeup to the girls' uniform at school. 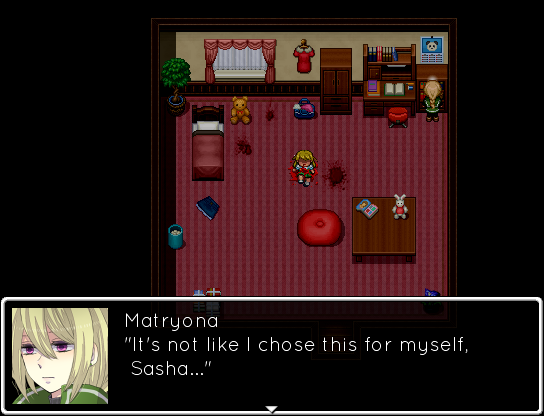 Matryona obviously resents this, which leads to murder once Sasha, a "real" girl, shows up. While the scenario allows for a (telegraphed) "twist" that Matryona is a boy, because of where the choices fall, it's not meaningful. Matryona has no conflict about gender identity, and even in a flashback to Matryona's birth, it's never clear exactly what motivates his mother to raise him as a girl. The story can be simplified to "Matryona's parents wrong Matryona" -> "Matryona takes revenge" and that negates the entire gender question completely. The meat of the conflict doesn't have an impact on the part of the story the player witnesses, which makes it feel like Matryona's Last Night just doesn't have a lot to say. There's a clear villain to blame (Matryona's mother) and her actions come off as arbitrary cruelty. The question of whether Matryona's actions are justified isn't a major theme, and because Matryona has no inner conflict himself, there's no real statement to be made here. Matryona's Last Night is basically a narrative experiment. Is it interesting to investigate the same scene three times in a row, moving backwards to figure out the truth? Yes. Is the actual linearized plot of the game meaningful? I don't think so, anyway. I'd like to see more non-linear storytelling in RM games, although maybe with stories that had more impact in their core twist. At least it's short. To the translation team -- much thanks for your work on this project. It seems to be the kind of low-hanging fruit worth bringing to English audiences.